I've been hermiting* lately. My weeks are spent head down, bum up at work and my weekends have been spent hiding away, catching up on sleep and ignoring anything I don't quite feel like doing. I think this is a combination of being too tired to do anything much and from not wanting to spend ANY money (do I hear Europe in 11 weeks? Weeeee...!). Today however, marked the start of the long Easter weekend in which I will mostly sew, cook meals that take a whole day to prepare, watch TV and eat chocolate (aka be a productive chocolate-eating hermit). And while Autumn has officially decended upon Sydney, the weather, as usual, is still lovely and warm. Perfect shorts weather infact. 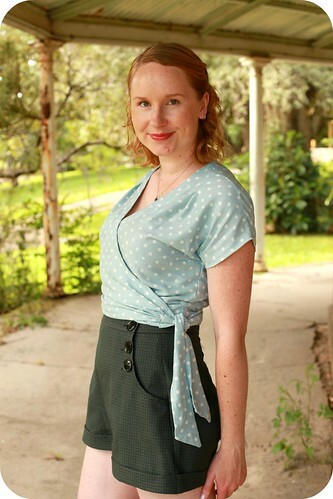 The wrap blouse is one I actually made back in 2010 from a vintage pattern that has never been worn on the blog! Oops. Love your shorts! How excitng the countdown until Europe Woo Hoo! I have just signed up for pinterest I can't wait to start. Did you make the shorts as well? If so, where did you get the pattern? They are really cute! Gorgeous outfit! I am on instagram but I don't use it much. I think my username is pettisnpeplums. I'm on pinterest too! That stuff is addictive. This outfit is really lovely. 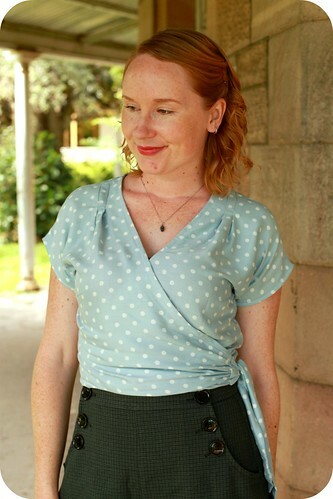 I have the same blouse pattern in my stash, and now you've inspired me to make it up! Ohh, I love those shorts! Did you make them and if so what's the pattern? ?